“An address by a foreign leader to both houses of parliament is not an automatic right; it is an earned honor,” Bercow concluded. The speaker of the United Kingdom’s lower house of parliament said Monday he would block any plans for U.S. President Donald Trump to address parliament during a state visit planned for later this year, citing Trump’s immigration ban as a factor. Asked by an opposition Labour lawmaker about the possibility of a parliamentary address, House of Commons speaker John Bercow said he would oppose any such event. 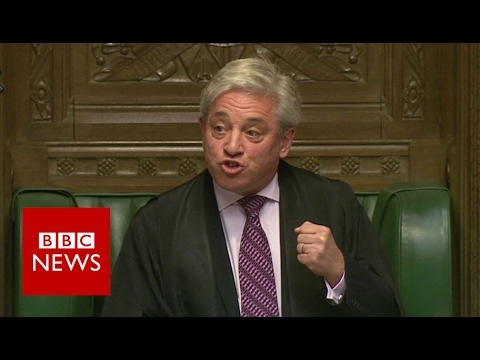 “As far as this place (parliament) is concerned, I feel very strongly that our opposition to racism and to sexism and our support for equality before the law and an independent judiciary are hugely important considerations,” Bercow said, earning a round of applause from lawmakers. The travel ban made him “even more strongly opposed to an address by President Trump in Westminster Hall,” Bercow told the lawmakers. More than 1.8 million people in the U.K. have signed a petition calling for Trump’s planned visit to be canceled or downgraded, part of a grassroots protest against his immigration policies. While British Prime Minister Theresa May has defended the decision to offer a state visit, more than 150 lawmakers have signed a symbolic motion calling for Trump not to be given the honor of speaking in parliament. Trump’s executive order barring entry to the United States for refugees and people from seven Muslim-majority countries has prompted worldwide protests, including by thousands of demonstrators in London. The temporary immigration ban faced a legal hurdle Monday that could determine whether he can push through the most controversial and far-reaching policy of his first two weeks in office. As one of the key figures whose approval would be needed for a parliamentary address, Bercow said he would oppose any possible move to invite Trump to speak in either of the two locations which host foreign leaders during state visits. In 2011, Trump’s predecessor Barack Obama became the first U.S. president to address both houses of parliament in Westminster Hall, the oldest building in the parliamentary palace, which has also hosted South Africa’s Nelson Mandela and France’s Charles de Gaulle.